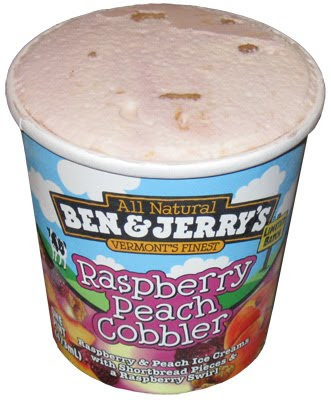 Well, what do I see but Ben & Jerry's Limited Edition Raspberry Peach Cobbler. 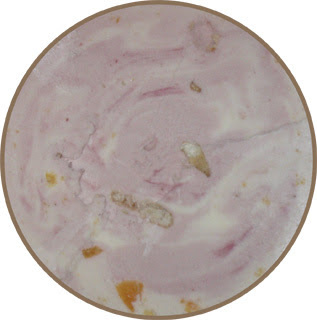 It's raspberry and peach ice creams with shortbread pieces & a raspberry swirl. A fresh B&J raspberry flavor? That's all I really need to know. Mix that with Peaches? Well, I'm not really sure how I feel about it, but since the Peach Cobbler was well made, I'm willing to give it a try. I cracked open the container and am presented with an interesting swirly purply concoctions. I spy several shortbread pieces as well as tiny peach chunks. I'm not really seeing the raspberry "swirl". If you look close, you will see tiny little dark purple streaks, but that's it. This isn't necessarily a deal breaker, but recently I've gotten in the habit of questioning ice cream companies lingo. Time for the taste test ...and ...hmmm, well, do you know how it tastes? like peaches unfortunately. The peaches are totally overriding the raspberry here. I was hoping for a raspberry flavor with that sweet peach tang, but instead its a peach flavor that's been mellowed by an almost indiscernible raspberry flavor. Here's a rogue large chunk of shortbread. Sorry there is nothing in the picture for comparison, but it's a good half inch piece. Overall, I really don't seem to be finding that many pieces. I'd really love to find a couple of these in every scoop, in fact, I kind of expect it with Ben & Jerry's, but it just ain't happening. So while this is a well made mellow flavor, I can't say I'll buy it again. 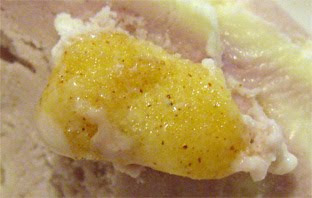 I just don't enjoy peach flavored ice cream. Actually, this is one of those rogue flavors that my daughter actually tried and didn't finish. I said she could stop and she said OK and went on her merry way. That only happens maybe once every three to four months on this blog. Hi! I just wanted to say, thank you you for creating this blog. I'm obsessed with ice cream, and I've often wished for a blog that reviews really great new commercial flavors. Good luck, and thanks! It's amazing that there always seems to be something new for me to discover in the freezer section, I'll do my best to keep up! This is my favorite ice cream of all time! Died to know it was only limited edition. Truly wish they still made it. Agreed that it needed more doughy chunks but as you indicated kind of biased about your peach preference. The ice cream alone (chunks of everything aside) tasted very raspberry so it didn't really bother me that the swirls were not as plentiful as possible (although they were not incredibly sparse either). Get a scoops of everything: peach, raspberry and some shortbread and you are in for a taste of heaven! If anyone can still find this ice cream somewhere I highly recommend you give it a try! Really delicious and well put together flavor.